Lisa and Ralph play on the swings in the promotional image. "I will not call the principal "spud head."" The family dances along with elephants and various circus performers. "I Love Lisa" is the fifteenth episode of The Simpsons' fourth season. It originally aired on the Fox network in the United States on February 11, 1993. 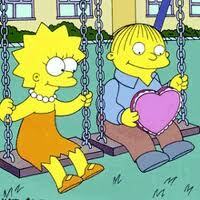 In the episode, Lisa gives Ralph Wiggum a Valentine's Day card when she sees that he has not received any. Ralph reads too much into Lisa's gesture and, much to Lisa's dismay, relentlessly pursues her with affection. Lisa snaps at Ralph and angrily tells him they are not together and that she never liked him. Heartbroken, Ralph channels his feelings into his performance as George Washington in the school's President's Day pageant. After a thunderous applause from the audience, he is able to accept Lisa as just a friend. Frank Mula wrote the episode, and Wes Archer served as director. Michael Carrington guest-starred as Rex. Al Jean, show runner of the episode, came up with the idea for the story when he remembered that he had received a valentine from a girl in third grade that read "I Choo-Choo-Choose You". The episode features cultural references to songs such as "Monster Mash" and "Break on Through", as well as a reference to the fictional character Droopy. Since airing, "I Love Lisa" has received mostly positive reviews from television critics; Entertainment Weekly placed the episode twelfth on their top 25 The Simpsons episodes list. It acquired a Nielsen rating of 14.9 and was the highest rated show on the Fox network the week it aired. The staff received an angry letter from a Vietnam veteran because of a flashback scene depicting the fatal shooting of a Vietnam soldier. On Valentine's Day in Springfield, Lisa's class at the Springfield Elementary School constructs paper mailboxes for Valentine cards they are about to receive from each other. When Ralph breaks down in tears after getting no cards, Lisa gives him one out of sympathy. Ralph cheers up, develops a romantic interest in Lisa, and begins to annoy Lisa at every turn. Lisa tries to tell Ralph she is not ready to be romantic, but Ralph uses his position as Chief Wiggum's son to get her tickets to Krusty the Clown's upcoming 29th Anniversary Special, and a leading part for himself in the school's President's Day pageant (as George Washington), in which Lisa also stars as Martha Washington. With Homer having convinced Lisa that nothing can go wrong at Krusty's show, Lisa and Ralph go together. Live on air, Krusty begins interviewing audience members, and Ralph takes the opportunity to declare that Lisa is the love of his life and he intends to marry her in the future. Angry, Lisa snaps, stating she had never liked him and only gave him a Valentine card because nobody else would. Later at home, Bart, having tape-recorded the event, replays the scene to Lisa where Ralph is humiliated and deeply hurt, making her feel guilty and regretful. On the night of the pageant, Lisa tries to apologize to Ralph, but he ignores her, burning her card in a fireplace, to focus on his role. Ralph proves to be a remarkably effective and eloquent actor, gaining the approval of the audience. Lisa approaches Ralph after the performance, apologizes for her actions, and gives him a new card with a picture of a bee on it, reading "Let's 'Bee' Friends". Ralph laughs at the pun and happily accepts the offer of friendship. A personal event of Al Jean's life inspired the plot of this episode. This was the first episode Frank Mula wrote for The Simpsons. Mula had previously worked with Simpsons executive producer Sam Simon at another Gracie Films show. This was the first season four episode that Wes Archer directed. Jeff Martin and Mula wrote the music for the President's Day pageant. Michael Carrington guest-stars in the episode as Rex, the boy who auditions for the role of George Washington but is beaten by Ralph. The story of "I Love Lisa" originated from a personal episode of Al Jean's life; when Jean was in third grade, he received a valentine from a girl that read "I Choo-Choo-Choose You". Years later, Jean wondered if the girl had really liked him. He told writing partner Mike Reiss about it and they thought it could be an idea for an episode where Lisa could give such a valentine to Ralph Wiggum, who would then take it too far. At that time, Ralph and Chief Wiggum were not established as being related. Jean thought it would be funny if Ralph was Wiggum's son, considering both characters are "fat and dumb". Despite this, Ralph's last name was already revealed to be Wiggum in the episode Kamp Krusty. A technique the staff used to come up with stories and ideas was to think "what holiday haven't we done on The Simpsons, or done lately?". As they had done several Halloween and Christmas episodes before, the staff liked the idea of doing a Valentine's Day episode. The songs "Monster Mash" (by Bobby "Boris" Pickett) and "Break on Through (To the Other Side)" (by The Doors) are featured in the episode. The orchestral version of Tony Bennett's "Stranger in Paradise" can be heard in an Itchy and Scratchy cartoon. Homer's conscience, which tells him that stealing is wrong, speaks with the voice of the fictional character Droopy. Principal Skinner's flashback is based on the movie Apocalypse Now, with Laurence Fishburne and Frederic Forrest's characters visible in the background during the sequence. During the re-enactment of the Abraham Lincoln assassination at the school pageant, Bart says "Hasta la vista, Abie" in reference to the film Terminator 2: Judgment Day. The scene of Chief Wiggum sitting behind Krusty at an adult movie theater and Krusty thinking he is about to be arrested is a reference to Paul Reubens' arrest for masturbating at a pornographic movie theater in Sarasota, Florida. In its original broadcast, "I Love Lisa" finished eighteenth in the ratings for the week of February 6 to February 12, 1993, with a Nielsen rating of 14.9. The episode was the highest-rated show on the Fox network that week. Since airing, it has received many positive reviews from fans and television critics. Entertainment Weekly's Dalton Ross said the episode was both touching and humorous. He added that in the scene where Bart runs a videotape in slow motion to show Lisa how "you can actually pin-point the second when [Ralph Wiggum's] heart rips in half", the audience does not really know "whether you're shedding tears of laughter, empathy, or both—you just know that it's damn good any way you slice it." The Arizona Republic's Bill Goodykoontz named the episode one of his five favorites and highlighted Ralph's line "and my doctor said I wouldn't have so many nosebleeds if I kept my finger out of there" as one of the best lines in the history of the show. In a review of The Simpsons season four, Lyndsey Shinoda of Video Store cited "Brother from the Same Planet" and "I Love Lisa" among her "personal favorites" from the season. Warren Martyn and Adrian Wood, the authors of the book I Can't Believe It's a Bigger and Better Updated Unofficial Simpsons Guide, said their favorite scenes from the episode include Principal Skinner's flashback to Valentine's Day in Vietnam, the scene in which Chief Wiggum chases a duck to get his badge back, and the one where Bart and Milhouse play John Wilkes Booth and Abraham Lincoln respectively at the school pageant. They added that those scenes were "just the icing on the cake of the main plot." In 2003, Entertainment Weekly placed the episode twelfth on their top 25 The Simpsons episodes list, and in 2008 placed the episode second on their top "25 New Classic Holiday TV Episodes" list. When Principal Skinner tells the children at school that Valentine's Day is not a joke (due to Bart fabricating candy hearts with mean insults), he has a flashback in which he is sitting in a PBR somewhere in Da Nang in 1969. On an oil drum next to him is a manila envelope and a photograph of Colonel Kurtz. Skinner sees Johnny, one of his army friends, holding a Valentine card and asks him, "Sending your chick a Valentine? ", to which Johnny replies "Yep", right before he is shot to death. Cutting back to the present, Skinner repeatedly calls out Johnny's name in anguish, to which a perplexed Bart states "Cool! I broke his brain." After the episode aired, a Vietnam veteran sent in a letter to the show that read, "I was watching the Valentine's Day episode of your cartoon and I saw the horrifying Vietnam flashback. Do you really think this was funny, this horrible experience?" The staff ignored the letter and, as Wes Archer pointed out, the scene was "an obvious" reference to Apocalypse Now even featuring characters that resembled Chef (Frederic Forrest) and Mr. Clean (Laurence Fishburne). In contrast, Mark Groening—the brother of Matt Groening and himself a Vietnam veteran—"loved" the sequence as well as the episode. ^ a b c d e f g Martyn, Warren; Wood, Adrian (2000). "I Love Lisa". BBC. Retrieved 2008-09-19. ^ a b "I Love Lisa". The Simpsons.com. Retrieved 2008-09-20. ^ Bates, James W.; Gimple, Scott M.; McCann, Jesse L.; Richmond, Ray; Seghers, Christine, eds. (2010). Simpsons World The Ultimate Episode Guide: Seasons 1–20 (1st ed.). Harper Collins Publishers. p. 1111. ISBN 978-0-00-738815-8. ^ Groening, Matt (1997). Richmond, Ray; Coffman, Antonia, eds. The Simpsons: A Complete Guide to Our Favorite Family (1st ed.). New York: HarperPerennial. p. 108. ISBN 978-0-06-095252-5. LCCN 98141857. OCLC 37796735. OL 433519M. .
^ a b Frank, Mula (2004). The Simpsons The Complete Fourth Season DVD commentary for the episode "I Love Lisa" (DVD). 20th Century Fox. ^ a b c Archer, Wes (2004). The Simpsons The Complete Fourth Season DVD commentary for the episode "I Love Lisa" (DVD). 20th Century Fox. ^ a b c d e f g h Jean, Al (2004). The Simpsons The Complete Fourth Season DVD commentary for the episode "I Love Lisa" (DVD). 20th Century Fox. ^ Silverman, David (2004). The Simpsons The Complete Fourth Season DVD commentary for the episode "I Love Lisa" (DVD). 20th Century Fox. ^ a b "What we watch, what we don't". Austin American-Statesman. February 14, 1993. p. 13. ^ a b Ross, Dalton (June 18, 2004). "The Simpsons: The Complete Fourth Season". Entertainment Weekly. Retrieved 2007-09-06. ^ Goodykoontz, Bill (July 26, 2007). "5 Best Simpsons". The Arizona Republic. p. 6. ^ Shinoda, Lyndsey (June 13, 2004). "The Simpsons: the Complete Fourth Season". Video Store. Advanstar Communications. ^ "The Family Dynamic". Entertainment Weekly. 2003-01-29. Retrieved 2007-05-09. ^ "25 New Classic Holiday TV Episodes". Entertainment Weekly. 2008-06-17. Retrieved 2008-06-19. ^ Groening, Matt (2004). The Simpsons The Complete Fourth Season DVD commentary for the episode "I Love Lisa" (DVD). 20th Century Fox. Wikiquote has quotations related to: "I Love Lisa"
"I Love Lisa episode capsule". The Simpsons Archive. This page was last edited on 16 April 2019, at 09:13 (UTC).